Heat half the oil in a wok and add the beef strips. Brown well, then remove and set aside. Heat the remaining oil and add the vegetables, ginger, garlic and chillies. Stir-fry for 3 to 4 minutes. 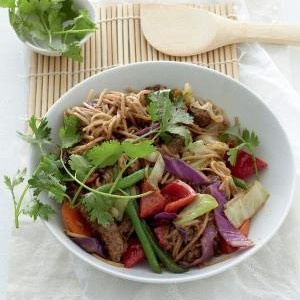 Mix the soy sauce and peanut butter together and add to the wok along with the beef and the juices in the bowl. Stir to combine all the ingredients well. Season to taste. Serve with egg noodles and fresh coriander.